It occurred to me the other day that most of the photographs I put on this blog are of Cardiff Bay. Cardiff is a splendid City but it is not a patch on Swansea, which after all has a real bay not an enclosed river inlet masquerading as one. 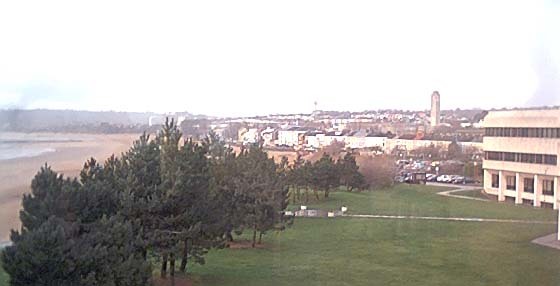 This view is looking out from the Members' Room in County Hall towards Mumbles. The large tower is the clock tower of the Guildhall, whilst the University can just be made out in the distance behind the tallest tree.